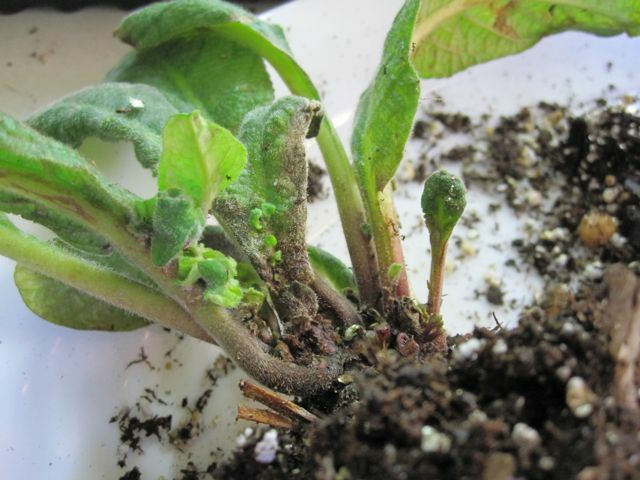 Streptocarpus are a fiberous rooted member of the Gesneriad family. They usually reproduce by rather conventional means such as seeds and the occasional leaf cutting. But here are two very different methods that the strep has chosen to ensure that it's DNA isn't lost. In the first photo a very distressed strep is trying to think of anything it can to keep alive. You can see from the poor leaf quality and the darkened base that this plant was probably severely over watered and was just hanging on by a thread.You will note in the above photo that the center leaf is starting to produce new leaves. These are NOT flower buds. Normally, a strep will make a row of buds running up the leaf starting at the base, but these are new leaves trying to form. The front leaf to the left side of center has more of the baby leaves that are a bit larger. It's definitely a last ditch effort to reproduce before dying. This photo also shows an unusual method for a strep to reproduce, but it's the opposite of the top photo. 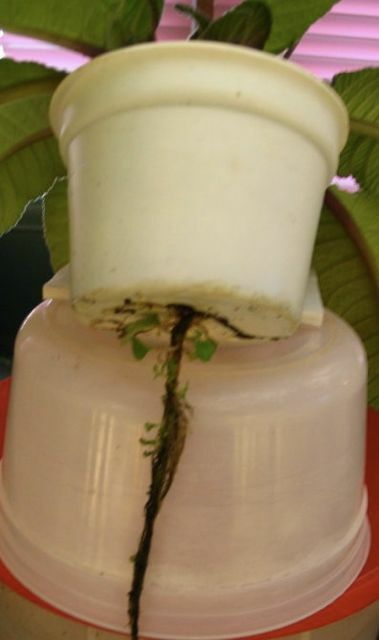 It's living conditions are so very favorable that it's sending out babies along the roots that were in the wick-watering pot. In this case, the plant is already doing so well it's figuring that it should just keep on sending out bits of itself to grow since it's life is so easy and everything is provided. It would be an interesting experiment to see if the baby plants along the roots were able to be potted up. As far as I know it wasn't tried with this plant. Thanks to Sharon for providing this happy plant for us to look at! Comments???? Leave some, it makes us happy.